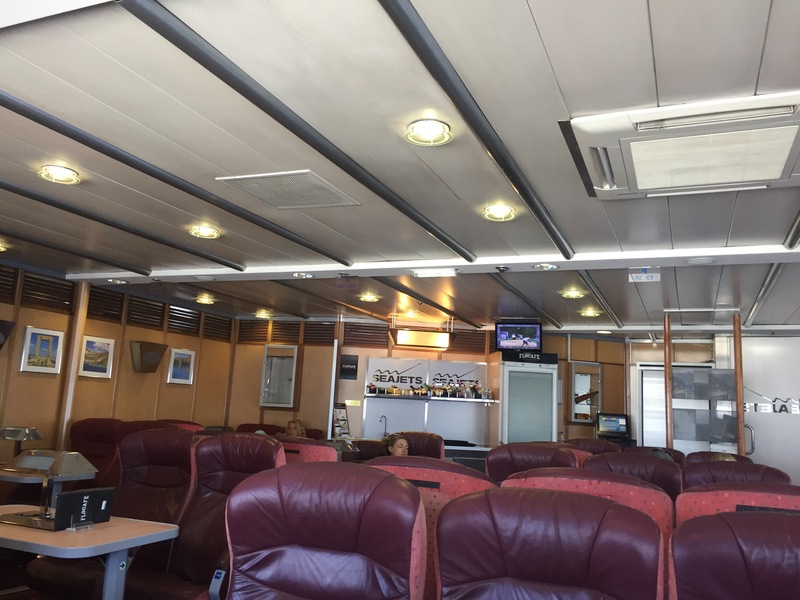 Travel by ferry, as I’ve done the past week or so in the Aegean, is more convenient and comfortable than traveling by airplane but less convenient and comfortable than traveling by train. If you have the opportunity to do it without undue difficulty, then you ought to. Having 15 days to spend in Greece, I decided to spend six of those in the Aegean (in the east), six in the Adriatic (in the west), and three on the mainland (in the middle, so to speak). I am nothing if not formulaic in my approach to planning most anything. My time in the Aegean leading into my time in Athens afforded me the option of traveling by ferry, and I’m glad I took myself up on the offer. From Santorini to Naxos, I took the slow boat. Blue Star Ferries was the name of the company, and I bought a coach ticket for around 40 euros. The seas were calm, and if I hadn’t looked up occasionally and out of the window (I used the time to catch up on my journaling), I would not have known the boat was in motion at all. The ride was extremely comfortable, and not having to deal with airport security and flight-related discomfort and annoyance was a nice bonus. As is the case on a train, being able to get up and walk around is a nice feature. The seats were airplane-style seats but – on the first boat, at least – there were separate armrests for each chair. I rather liked it. The trip took approximately two and a half hours from Santorini to Naxos – plenty of time to catch up on reading, writing, or napping. 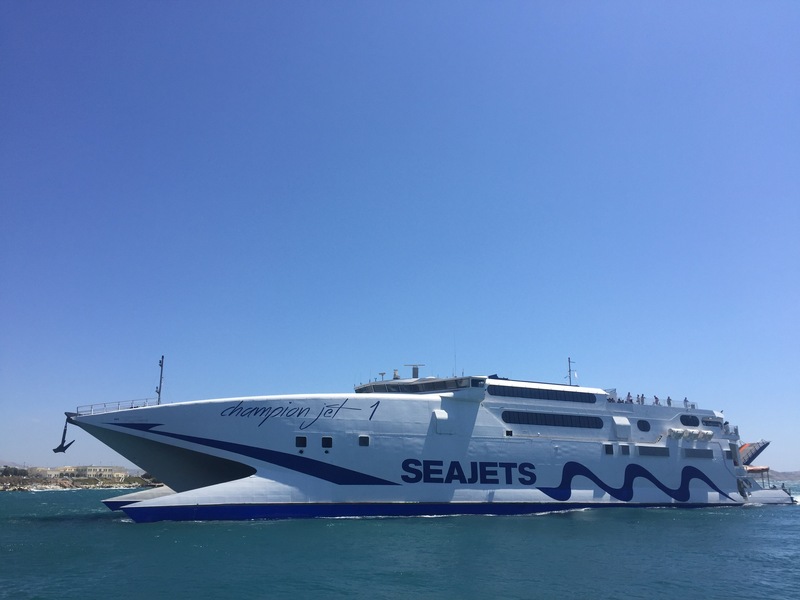 The second boat – a Sea Jet, high-speed ferry, took me from Naxos to Athens (Piraeus Port, connected to the center of town by buses or – as I prefer – by city train) in about 4 hours. That shaved maybe an hour or two off the “slow boat” ride. Also, I paid for the “premium cabin” class of service, which took my total ticket cost from 50 to about 80 euros on this occasion. I wanted to get the feeling for what I’d get at that rate to compare it with the coach-class fare. Here’s my verdict: it was not worth the uptick in cost. The seats were of faux leather and were, objectively, much more comfortable seats than the coach-class seating I’d had before, but they weren’t 75%-more-money more comfortable. Oh well; live and learn. This ride was much rougher than the big-boat ride, as well. 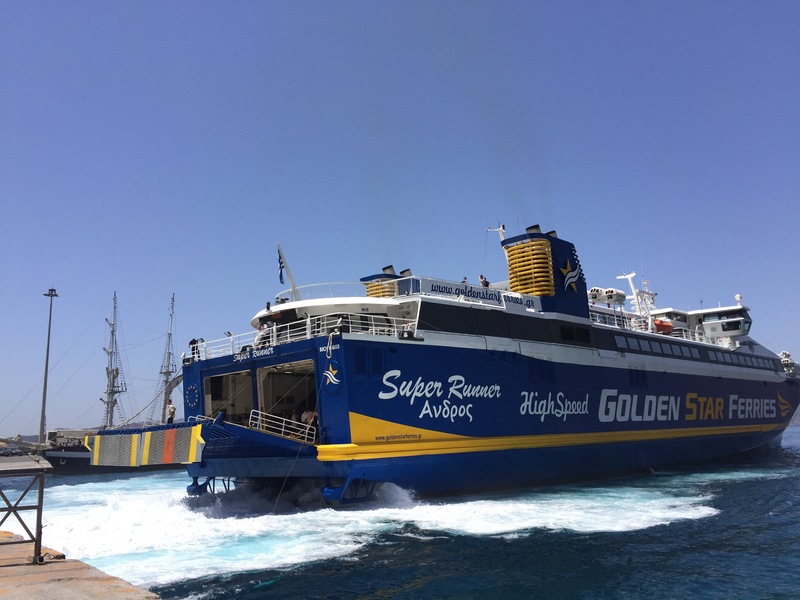 The seas were surely much more choppy – whitecaps were everywhere in my field of vision, and the 3+-foot waves crashing into Naxos were spraying water 40-60 feet overland. The ferry, too, was built to sit on top of the water rather than in it, and it was smaller than the first – both of these factors undoubtedly affect the smoothness of the ride. I would have hated to be the waiter working the premium cabin on that day. The captain gave him a break when she / he determined that everyone ought to just sit down “and keep little ones near” for all our safety’s sake. I was affected enough by the jostling that I was glad after the first thirty minutes that I hadn’t eaten much since three or four hours pre-journey, but I was not so affected that I didn’t look soon afterward at the menu and select a chicken sandwich from the reasonably-priced offerings onboard. All in all, I’d certainly travel by ferry again. Assuredly, I’d do so in the Aegean, where it seems most natural to do so. And I’ll likely stick with coach or try a middle-range class of service. I’ll be flying from Athens to Corfu in two days’ time, and I’m already not looking forward to airport annoyances and the need to arrive an hour from my hotel by 7:30am at the latest. Take heed that for many of these companies (perhaps all? ), you’ll need to pick up your pre-booked ticket in an affiliated ticketing office. This isn’t tough, as it seems several of the major islands host ticketing offices for all of the companies operating out of those ports. If you’re willing to spend the cash, the companies will ship you the tickets at an exorbitant fee designed only to discourage you from taking them up on the offer ($40 to $50 USD, if memory serves, for the two companies I used). All this means is that you should plan to pick up those tickets while you visit the major island on which you begin your touring. Also note: If you’re like me, you don’t want to travel backwards, and you can opt for specific seating when you book with the company in question. service of connecting you with the correct boat. You’ll be able to figure things out if you go directly to and with the company running the ferry. Remember: You can follow the summer’s adventures from the main page for 2017! This entry was posted in Travelogue, Travelogue 2017, Travels and tagged aegean sea, airplanes, backpacking, cyclades, europe, european travel, ferries, ferry travel, greece, kyklades, Slow Travel, trains, travel. Bookmark the permalink.